How to practise it properly? Awareness is the constant in meditation. Awareness is being present, in this moment, and there are delightful ways to be present. Awareness is seeing things equally undivided by opinion and self-appraisal. Awareness is becoming free from the demands of the mind. Learn to let the mind rest and enjoy a different, deeper kind of relaxation, that will leave you wiser, and more ready for the demands of life. Swami Anandakumar is an exceptional teacher in meditation. He has practised yoga and related disciplines for over thirty years and has spent many years teaching, in India and internationally. 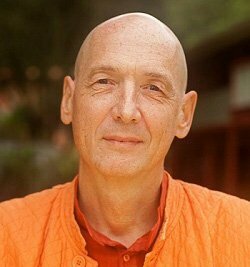 He inspires with his depth of wisdom, and with his warm down-to-earth manner, he makes the mystery of meditation accessible. We will be conducting a kirtan session (will last between 15-45 minutes) after the meditation programme with a 15 minutes break in between. The kirtan session is optional. For those who are new to kirtan, it is a chanting practice and has the ability to still the mind. Kirtan offers rest for the mind and awakens the heart.